The day has finally come to graduate. At times I’ve dreamt of this moment and at other times I’ve dreaded it. On one hand I made it to the finish line and I’m ready to begin my life as an adult. On the other hand college is over and there will never be another experience quite like it. Today I want to talk about a few things I learned over the years at college. My second semester in college I tried to make my own schedule and I failed miserably. Long story short, I ended up getting a C in a five-credit class that I didn’t even need to take. After that I was in my advisor’s office multiple times every semester. Not only were we able to find a schedule that worked for me, I was also able to make up for lost time and graduate in four years. It definitely helped that my advisor was awesome, which I know isn’t the case for everyone. I had to switch once myself, so don’t be afraid to switch your advisor as well. When you have piles of student loans and money is tight it is tempting to make a few easy bucks by selling your textbooks, but I’m here to tell you it might be worth keeping them. You’ve invested a lot of money into these books, so selling them back to the school for a tenth of what you bought them seems crazy. Sometimes you can get a decent deal selling them online, but what if you need the textbooks again someday? Granted there are plenty of resources on the internet, but you’ll never know another book as well as you know your undergraduate textbooks. My biggest regret is not getting involved in more extracurricular activities. Getting involved with clubs, especially clubs related to your chosen career path, will help you make connections, build practical skills, and impress employers. Working on a team and communicating with people are two of the most important skills a person can have in the work force. Some people don’t get involved because they think they don’t have enough time and they’re worried that their grades with drop. This is definitely a reasonable concern, but if you ask any employer many of them will say that they put a lot more value on practical and communication skills than grades. When you are presented with an opportunity that seems unusual or out of your comfort zone, seize it. Some of my best experiences have happened because I was willing to take a risk every now and then. It should go without saying that you should never do something that may put your life at risk, but don’t be afraid to try out a new sport, or study abroad, or even just talk to a classmate who you haven’t met yet. You never know what might happen. My final piece of advice is to meet people! College is tough, but you don’t need to do it alone. Whether you are working on homework together or just letting off some steam it is important to have a solid network of friends. Not to mention that the connections you make in college may be your co-workers down the road or life long friends. So in summation, enjoy your time in college while it lasts. Personally I don’t believe that college will be the best time of you’re life, but there is no denying that college is an incredible experience. If you want to live without regrets then make sure to stop and smell the roses once and awhile. For those still in school, good luck and have fun! For those currently graduating, congratulations and good luck in your future endeavors! For those who aren’t familiar with GoldPASS, it is a career website owned by the University of Minnesota where employers can post job opportunities for U of M students and alumni. When you first use GoldPASS you are required to upload your resume before applying to positions. The University of Minnesota Duluth Career & Internship Services office will review the first resume you upload, if you are UMD student or alum. When your resume is being reviewed it has the potential of being Approved, Approved with Reservations, or Unapproved. The main reason for this approval process is not to dictate what resumes the office wants on the website. Our office cares deeply about providing students with the necessary tools to succeed. For this reason, the approval process is used to provide students with feedback and help increase their chances of being hired, as much as possible. The following blog post will list the main reasons why a resume is either approved, approved with reservations, or unapproved on GoldPASS. If you are wondering why your resume received a certain rating or if you simply want to make your resume as professional as possible, then the following list will be extremely helpful. *NOTE: Each resume is unique, and no one factor renders a resume “unapprovable,” but consider the guidelines below when submitting a resume. Consistency in dates, dashes, spaces, alignment, bolding, etc. Resumes are typically given the rating of “Approved with Reservations” when there are 2-3 “red flags” from the list below, depending on the severity. The rating “Approved with Reservations” will still allow you to use your resume on GoldPASS, but it is highly recommended that some changes be made. A resume will typically receive a rating of “Unapproved” if there are 3-4 “red flags” from the list below, depending on the severity. Inconsistencies in dates, dashes, alignment, etc. Use of incorrect wording, abbreviations, etc. Hopefully this will give you some insight into the thought process that goes into each resume review. Keep working hard on that resume and good luck in the rest of your job search! Are you a University of Minnesota student or alumni looking for a job? An internship? Or even volunteer work? If so, then GoldPASS is a great place to start! For those of you who aren’t familiar with GoldPASS, it is a University of Minnesota owned job site where you can find jobs, post jobs, apply for jobs, sign up for interviews, sign up for job fairs, and much more. 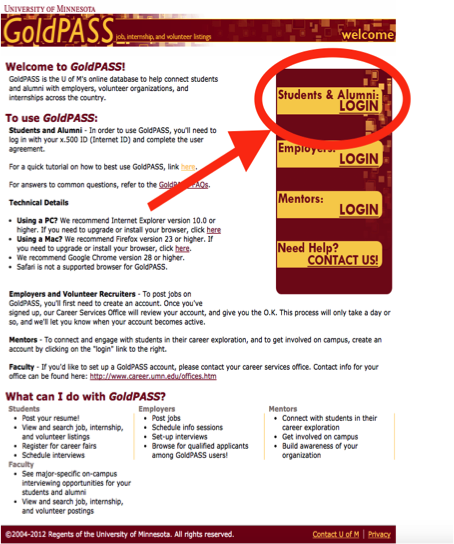 Within this blog post I will provide you with a brief walkthrough of how to apply for a job, internship, and/or volunteering position using GoldPASS from start to finish. 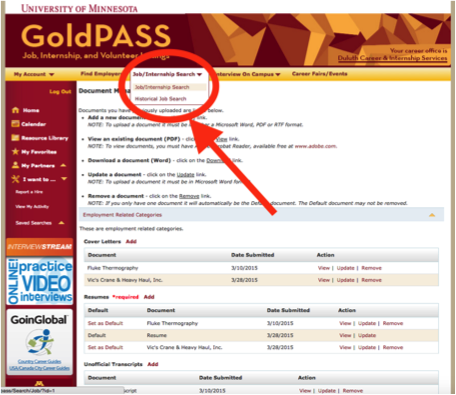 Once you have visited the website at www.goldpass.umn.edu you will want to sign in using the login ID provided by your UMN institution by clicking on “Students & Alumni: LOGIN” located in the upper right hand corner of the page. From there it will bring you to the homepage. Next you are required to submit a resume. You can submit your resume by clicking on “My Documents” under the same “My Account” tab located at the top left corner of the page. You can then add a resume by clicking “Add,” choosing a file, naming the file, and then clicking “Save.” If you need to write a resume, start here and here. 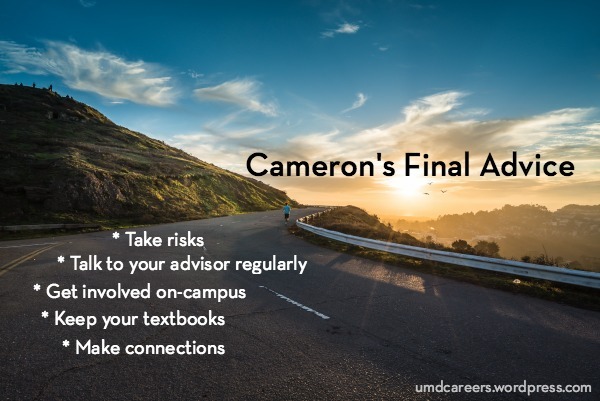 Once you add a resume your account will still be inactive until a Career Counselor or Peer Educator in our office has reviewed and approved your resume, if you’re a UMD students/alum. Once it has been reviewed you will receive an email indicating your resume’s approval/denial along with a few suggestions for improvement. This process should take no more than approximately two business days. This approval process only happens to the first resume you upload. Once your first resume is approved, you can submit other resumes or update the first resume without having to repeat the process. We have this review process in place so that we can ensure that you’re using a resume that employers will actually want to see. If you have multiple resumes then you can select one as your default. The default resume will be the resume that all employers are able to see. Other documents you can add include transcripts, cover letters, references, samples of your work, and more. Typically a resume and cover letter is sufficient. Now that you have your profile filled out and all your documents uploaded you can start searching for openings. To get to the job search engine click on the “Job/Internship Search” tab at the top of the page. As you’ll notice the search engine has several categories. The main categories I try to stick to are the position type, job category, degrees seeking or attained, and majors. 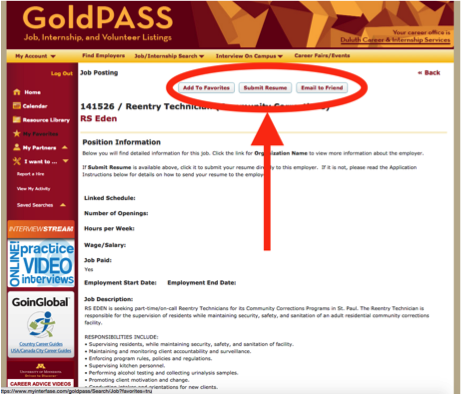 Also, make sure to check the box that says “Exclude Records with ‘All Majors.’” For more methods on searching for positions, reference Common Questions About GoldPASS. Once you have narrowed your search you can click on the position labeled in red to see the description. If you are interested in the position, you can click on the button at the top of the page that says “Add to Favorites.” Make sure to read the posting carefully. Each posting is created from a form that the employer fills out. For this reasons there is always a chance that they have not filled out certain information. Once your resume and cover letter are ready to go and uploaded you can start applying to the position. You can start by clicking on the button at the top of the posting that says “Submit Resume.” This will take you to another page where you can select the resume and cover letter that you want to submit. Make sure to select the correct documents. You can even write the employer a brief message expressing your interest in the position. There you have it! Here is a brief overview of how to apply for a position using GoldPASS from start to finish. Hopefully this will help you obtain that position you’ve been searching for. Good luck! In this post I will be reviewing the book Career Opportunities in Engineering: A Guide to Careers in Engineering, by Richard A. McDavid and Susan Echaore-McDavid. This book is an extremely helpful resource for anybody thinking about engineering or already going to school for engineering. The book is very comprehensive and outlines a wide variety of information on many engineering disciplines. The first half of the book focuses on the major disciplines, which are aerospace, agricultural and biological, biomedical, civil, chemical, electrical and electronics, environmental, industrial, materials, and mechanical. The second half of the book talks about more uncommon engineering disciplines, engineering specialties, and alternative non-engineering careers that most engineers are qualified for. Each engineering discipline summarizes everything from duties and positions to salary and job prospects. For the remainder of this post I will be summarizing the section in the book about Mechanical Engineering, since that is my current area of study. Hopefully this will give you a better picture of how the book is structured. Duties: Mechanical Engineers research, develop, design and produce machines, engines, and other mechanical devices. There is a very broad spectrum of duties a Mechanical Engineer may be tasked with. Alternate Title(s): Different titles within mechanical engineering usually reflect specialty (such as Robotics Engineer) or a function (such as Project Engineer or Consultant). Salary: Mechanical Engineers are making between $44,000 to $100,000 according to the November 2004 Occupational Employment Statistics (OES) survey by the U.S. Bureau of Labor Statistics (BLS). Here’s data about recent grads from our own Mechanical Engineering major at UMD. Education-Bachelor’s degree in mechanical engineering with training on the job. Experience-Typically previous work experience is required. Special Skills and Personality Traits-Writing, communication, presentation, leadership, teamwork, interpersonal, analytical, and problem-solving skills; creative, detail-oriented, quick-witted, self-motivated, flexible, cooperative, reliable, and persistent. Special Requirements-Professional engineer (PE) license is sometimes required (for consulting usually). The section continues to describe each of these categories, among others, in more detailed paragraphs. Mechanical engineering specifically is just a broad profession that the book covers. Within this same section the book provides the same information for more specific jobs within mechanical engineering such as automotive engineer, HVAC/R engineer, and robotics engineer. In conclusion, I would describe this book as very useful and informative. For both students trying to declare a major and students graduating soon, this book is invaluable. The book clearly outlines a broad spectrum of professions within the engineering field. One of the nice things about the book is that it’s easy to skim, provides enough information that you can read in more detail if you would like. Overall I would definitely recommend looking into the book Career Opportunities in Engineering: A Guide to Careers in Engineering, by Richard A. McDavid and Susan Echaore-McDavid. You have a great resume, great experience, and a great cover letter, so why aren’t you getting any interviews? You may be missing one key factor in the application process, which is customizing your resume to fit the specific job postings. Many people use generic resumes that list their main skills and ask to obtain vague positions such as “Internship in Marketing.” While using this generic resume is very convenient, it could be detrimental to your application. 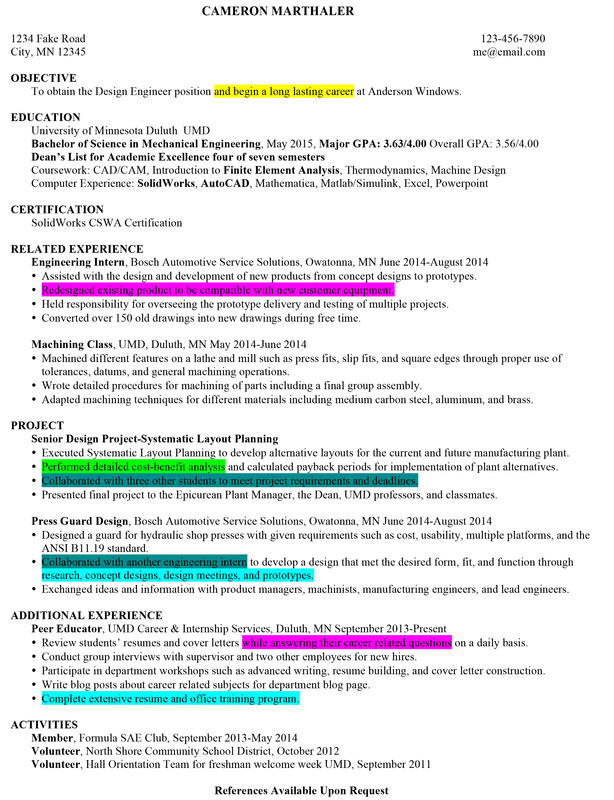 Why should I adjust my resume to fit the job posting? Most employers today use applicant tracking systems (ATS). An ATS scans resumes electronically in order find the most likely candidates. When your resume is being scanned the computer is looking for predetermined keywords and phrases. If you don’t have at least some of these keywords then your resume may be virtually invisible to the system, regardless of how good it is. For this reason alone it is essential that you adjust your resume to showcase your skills that match the job posting. How do I adjust my resume to fit the job posting? First off, it’s important to make a clear distinction between the job description and the job requirements/qualifications. The job description gives a brief overview of what you’re responsibilities will be if you receive the position. The job qualifications are a list of the skills and experiences they want from you. You’ll want to make sure and adjust your resume according to the qualifications listed and not the job description. How do I use the qualifications section to my advantage? This list is pretty straightforward as far as job postings go. Qualifications such as the college level engineering coursework and computer skills are low hanging fruit. You can easily add these skills to your resume by listing the courses and software if you haven’t already done so. The coursework is typically included in one line underneath the school in the Education section or in its own section. The computer skills and software are typically formatted the same as the coursework and often in a separate section. Theses are, of course, just examples. On your actual resume you will want to be as specific as possible, and still be concise. The bold words in the bullet points are words that the ATS might pick up for this job posting so they would be good to include. This kind of strategy can also be used in cover letters. So there you have it! Hopefully this post has sparked some good ideas for how you will tailor your resume to your next job application. It’s a general rule that if you meet at least 75% of the qualifications on a job posting, you should apply. So what are you waiting for?! You can stop by SCC 22 anytime we’re open (M-F 8-4:30) to have your resume reviewed by a Peer Educator. We also host Resume Drop-ins every Tuesday and Wednesday, 2-4pm, when classes are in session. Keep working hard on that application and good luck! GoldPASS is a University of Minnesota owned website where employers post job and internship opportunities. All University of Minnesota students and alumni have access to the site. Find it here. Once you log in with your University of Minnesota login information you will want to fill out your profile in the “My Account” tab at the top of the page. Then you will want to go into “My Documents” in the “My Account” tab and upload your resume. Your resume will be reviewed and either approved or unapproved for use on GoldPASS. If it is unapproved, make the suggested changes and upload the new resume. How many skills should I include when filling out my profile? It is not uncommon to have even twenty or more skills listed so feel free to be somewhat liberal when selecting skills. Having said that, there are a lot of skills out there that basically anyone could list such as numerical skills or writing so try and stick to the most relevant skills that will set you apart. You will also want to make sure and check the box that says “Exclude Records with ‘All Majors.” If you find some postings that you like you can always add them to your favorites. How do I apply to positions? In each posting there is a section titled “Application Method” that typically says to submit application through the company’s website. Then there will be a section below providing a link to the company’s website. Some positions also have a button at the top of the posting that says “Submit Resume.” Clicking on this will allow you to submit your resume and a cover letter. It is recommended that you apply using both methods whenever possible. What else can you do on GoldPASS? 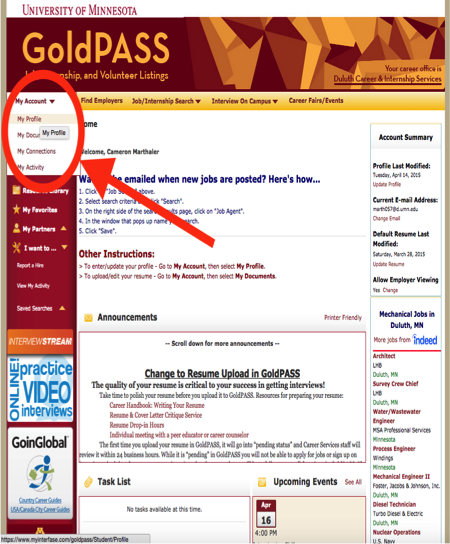 On GoldPASS you can also sign up for on-campus interviews, check the calendar for upcoming career fairs and events, and checkout the resource library which provides tons of information about all kinds of career-related topics.